The R3765CG/R3767CG network analyzers are vector network analyzers that incorporate a new RF circuit analysis technique. 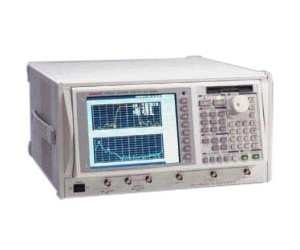 The measuring frequency range is from 300 kHz to 3.8 GHz (R3765CG)/300 kHz to 8 GHz (R3767CG). The unique ADVANTEST high-speed signal processing technology enables a faster measurement speed. In addition to the basic model, a model with built-in bridge transmission/reflection characteristic measurement and a model with a built-in S-parameter test set for forward and reverse measurement are also available. An optional 3-port test set or 4-port test set can be added to these models. By installing additional input channels in the receive section, the multi-port models allow perfectly simultaneous measurement of two different measurement paths, revolutionizing the measurement efficiency of multi-port devices. For type C, 4 S-parameters can be displayed simultaneously through 0.15 ms/point high speed frequency sweep and 4 channel/8 trace. Frequency, output level, RBW, and setting time can be set for each segment. Allows programming or data analysis using an MS-DOS PC with an MS-DOS format FD drive.